In our second stop on the Renovation Road Trip we met up with Katy and Brandon from Turtle House in Ypsilanti, MI. 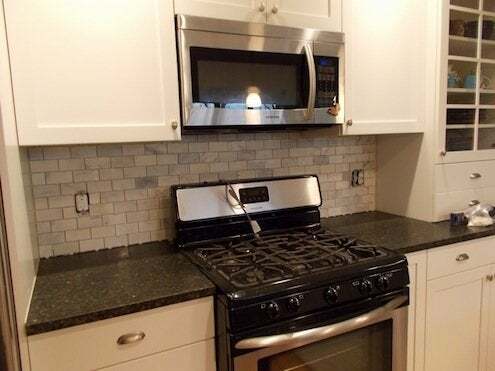 They’re a fun couple of teachers with a mostly finished home, who felt they needed a backsplash to really set off the area behind their stove. So we helped them. After clearing the area of all obstacles and removing the outlet covers, we gave the painted surface a quick sanding with 100-grit sandpaper. Then we got to work laying the subway tile out on the kitchen table to see how it would look. The top and bottom boundaries were just slightly larger than nine full tiles. 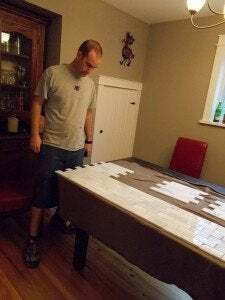 That meant we had the option of doing nine tiles and a sliver, or we could float the tiles to leave slightly more space top and bottom. We chose the latter method, since cutting a 1/8” sliver is difficult and not particularly attractive. We mixed up some thinset and and let it slake for 10 or 15 minutes. Since we were laying the tile on a vertical surface, we chose to mix the thinset a bit on the thicker side (more like peanut butter than pancake batter) to prevent the tile from sliding during installation. Our layout allowed us to work left to right. (If we’d been using large, square tiles, we would have started with a tile on the center line.) 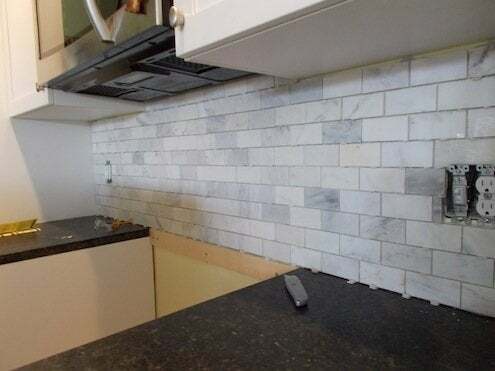 For our 2×4″ tiles, a ¼”-square notch trowel was perfect. We worked in sections that could be laid in ten minutes (so the thinset wouldn’t dry up on us), first troweling on a workable amount and then setting the tile (then repeating the process). Troweling on thinset can be a messy job. It’s always good to have a bucket of water and sponge on hand to clean up drops. When applying thinset to the wall, your first goal is to get enough on the surface. Some like to use a margin trowel for this purpose, while others use the flat side of a notched trowel. To set the tile, start from one edge of the sheet and lightly press the tile into the thinset, even as you are rolling the sheet onto the wall. I like to use a grout float to press the tiles into place, because it produces a flatter finished surface. Adjustable ‘wedge’ spacers will help you achieve even grout lines. 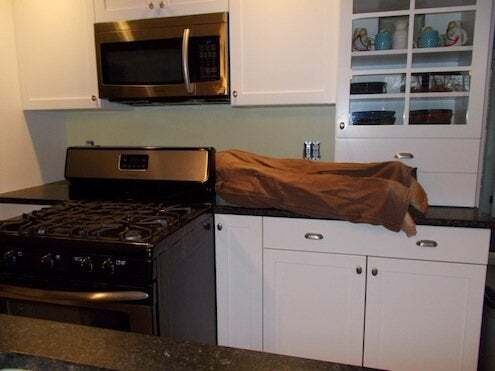 TIP: Working around obstructions like electrical outlets? Remove tile(s) that will obstruct the outlet before setting the tile sheet in place. 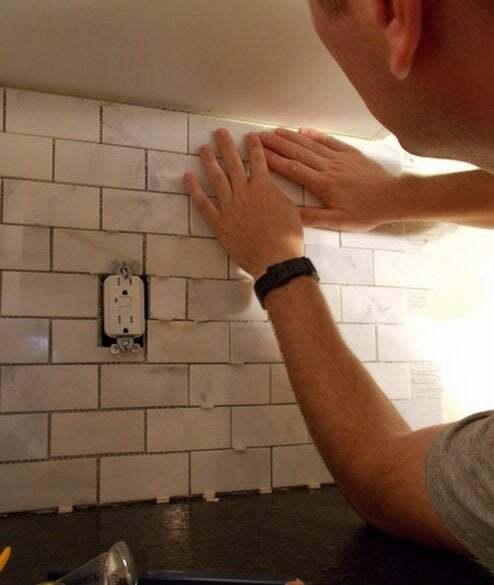 Once set, line the loose tile up and draw a notch where it overlaps the outlet. 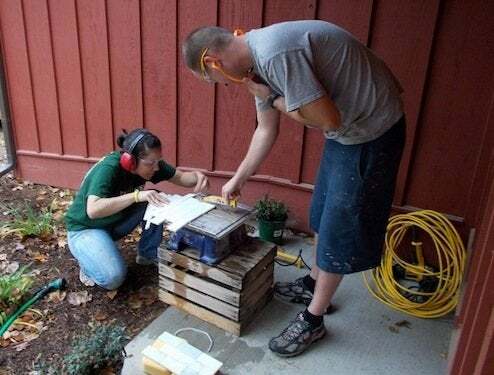 Cut using tile saw, grinder, or tile nippers and set in place. Make sure you don’t dump any excess thinset down the sink or toilet; throw it in the trash. We could only be at the Turtle House for a day, which meant grouting wasn’t in the cards, but Katy will tackle that project in a day or two. 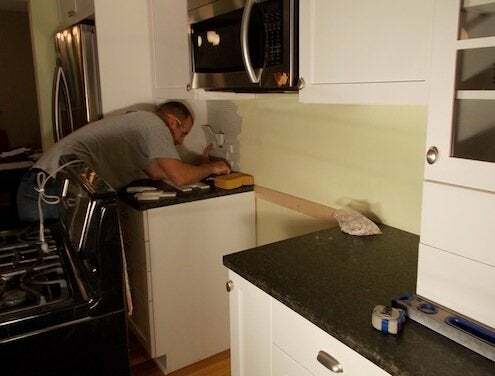 The usual procedure is to mix the grout to the consistency of toothpaste, let it slake, and then apply it with a grout float at a 45 degree angle to the grout lines. Our little project for Katy and Brandon only took about half a day, but it made a huge difference. Read every dispatch from the Renovation Road Trip right here.